The Tooth Fairy makes a new friend, while Will catches up with an old one as he and Hannibal come face to face for the first time in three years. I’m very much enjoying Richard Armitage’s work on the show so far. In his first appearance he perfectly conveyed how unhinged this man is despite having no lines of dialogue. This week he actually spoke, and also managed to show us a completely different side of his character. Francis Dolarhyde (as we now know him) is a very complicated monster indeed. There were moments here that would almost make you forget that this is a man who butchers entire families once a month. The moments he spent with Reba (Rutina Wesley from True Blood) were actually kind of nice. She’s blind, so she can’t see him the way he thinks other people do, and she also won’t judge him for his speech impediment. It’s the perfect pairing, until you remember that he’s a demented killer who believes he is evolving into a dragon. The rest of the episode felt like a family reunion in a way. Will and Hannibal chatting again was obviously the big one, but Hannibal was also visited by Alana and Jack. Freddie’s also returned to be a thorn in Will’s side once again. We even got to see some unexpected and rather fantastic flashbacks to Abigail’s time with Hannibal before her death. We really did touch on everybody here, from finding out why Alana is still hanging around to seeing how manipulative Jack can be. The Alana situation is fascinating to me. She gave birth to a Verger baby for Margot and is now set up for life with a family of her own. Yet she still can’t let go of Hannibal. He really did a number on her and now that the death penalty is off the table, she’s going to make sure he can never hurt anybody ever again. I’m also really liking how Jack is being portrayed. The events of last season’s finale seemed to have changed him, and he began this season looking to save Will. Now I think it looks like all of his stuff about only wanting to save Will was a load of crap. Jack definitely cares about Will and doesn’t want him to get killed, but he’s also willing to sacrifice Will’s mind if it means he can catch the killer. As I mentioned last week, it’s history repeating itself. Jack basically fed Will to Hannibal earlier in the series, and now he’s doing it all over again. I had seen some people during the week wondering how the hell Hannibal could even send that letter to Will in the first place, and the answer is because Jack wanted Will to get it. We’ve seen so much manipulation on this show over the course of three seasons, and Jack is one of the best there is at it. 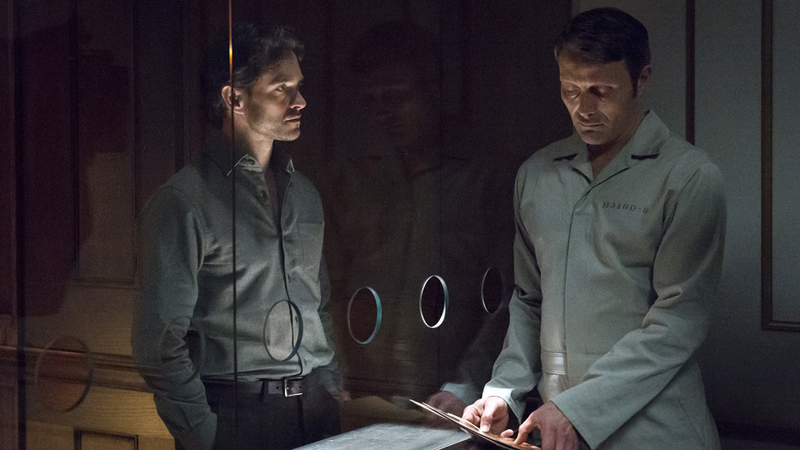 Hannibal and Will’s face to face didn’t disappoint. There was something a little bit different than usual about their back and forth. Hannibal seemed a little bit more hostile than usual. He wasn’t losing his cool or anything, but everything he said seemed to be designed to put Will on the back foot. This certainly wasn’t a meeting of two old friends, but there was still a sense of familiarity to it too. In many ways we’ve come full circle on the show. Jack throwing Will in at the deep end, Hannibal “consulting” on the case and Freddie causing trouble. The thing that really caught my attention here was Dolarhyde having the audacity to phone up Hannibal towards the end of the episode. He had already been taking a keen interest in Hannibal as evidenced by his little scrapbook, and this turn of events is really exciting. My favorite part of it was the look on Hannibal’s face when Dolarhyde told him he was transforming into “The Great Red Dragon.” It was almost a gleeful look from Hannibal, as if he had just made a magnificent new discovery. Dolarhyde is proving to be a quite captivating foe for Will and co. to face in these final run of episodes. Every scene he is in has an unsettling edge to it, and I’m really sure what he’s going to do next. One minute he’s being nice to a blind lady and the next he’s screaming his head off in his house, all while pretending he’s turning into a dragon. All of the other stuff was great this week too, with several interesting conversations between our main players and even some great Abigail flashbacks keeping me hooked for the entire episode. It was great to see Abigail again, and watch how she faked her own death with Hannibal and then fell deeper and deeper under his spell. Hannibal is the master manipulator on a show full of manipulative people, and now that Dolarhyde has made contact with him, I’m beginning to wonder if Hannibal could begin to manipulate him. It could be his final dastardly act on this fantastic show. What are your thoughts on Jack? Do you think he’s wrong to be using Will like this, or does the ends justify the means in this case? Tweet me @OldSnake24. And be sure to follow us @YouNerded!